Cavities will not only cause you pain in your mouth but also a hole in your wallet if you let the decay progress further as a more extensive dental treatment would be required to treat something that could have been prevented earlier on. Cavities or dental caries may be defined as a bacterial disease of the hard tissues of the teeth characterized by the breaking down of the mineral component of teeth and destruction of the organic substance of tooth. The carious process is the metabolic activity in the plaque. The result may be nothing to see or there may be a net loss of mineral resulting in a carious lesion that can be seen. Plaque is the cause of caries, and a tooth which is completely free of plaque will not decay. Dental plaque is an adherent deposit of bacteria and their products, which forms on all tooth surfaces and is the cause of caries. Plaque is a biofilm – a community of microorganism attached to a surface. The bacteria in plaque react with foods we eat to produce acids that can attack and weaken tooth enamel (the hard, protective covering on our teeth), opening the way for cavities to develop. Plaque can also irritate the gums, leading to gum disease, which, in its early stage, is called gingivitis. Pits and fissures on biting (occlusal) surfaces of the molars (back teeth) and inner surface of the upper front teeth. The smooth surfaces just at the neck to the contact point of two neighboring teeth. The neck of the tooth just above the gums margin. In individuals where periodontal disease has resulted in gum recession, the area of plaque stagnation is on the exposed root surface. The margins of dental restorations, particularly those that are faulty or overhanging. Tooth surfaces adjacent to dentures and bridges which make cleaning more difficult, and this encouraging plaque stagnation. © SPH Magazines Pte Ltd. Co.
Brush thoroughly twice a day using a soft bristled toothbrush. Every time you brush your teeth, you remove plaque that is constantly forming on your teeth. If you allow plaque to build up, it can harden into tartar (also called calculus), which can then only be removed by your dentist or hygienist. Brush last thing at night, so that the remains of the paste remain in the mouth when asleep because salivary flow is reduced. Brush on one other occasion for example, on rising, before breakfast. Use toothpaste that contains fluoride. Fluoride is proven to help prevent cavities. Clean between teeth daily to remove the plaque in areas where your toothbrush can not reach. Parents and guardians should begin brushing their children’s teeth once the primary teeth have started to erupt. Children under 7 years of age should be supervised. Only a pea-sized amount or smear of toothpaste should be used. Parents or guardians should ‘finish off’ the brushing, paying attention to the biting surfaces of erupting teeth. Do not rinse with large volumes of water, but rather spit out the excess. Encourage young children to spit out excess toothpaste rather than swallow it, to prevent fluorosis. 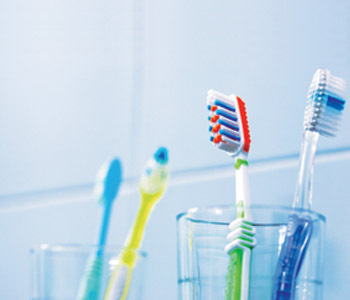 Replace your toothbrush every 3 months or sooner if the bristles begin to look worn out. A worn toothbrush would not be able to clean as efficiently as a normal one. Eat a well-balanced diet and keep sweets and sugary foods to a minimum. Choose sugar-free foods for snacking, for example fresh fruits and plain popcorn. If you are on medications, make sure your medicines are sugar-free. Cut down on carbonated soft drinks. Many soft drinks contains acid that can damage the tooth enamel. Avoid frequent intake of acidic foods or drinks and do not brush immediately after eating or drinking acidic foods or drinks to avoid sensitivity. You should visit your dentist or hygienist at least twice a year to let them professionally clean your teeth to remove hardened plaque (tartar) and examine your mouth. Regular dental checkups can allow early detections of oral diseases and enable treatment to be done as soon as possible.